Lawyers, including pro hac vice attorneys, who present photo identification and a current bar registration card from this or any other federal or state court may bring in electronic communication devices (see Rule 83.2.4). The public may not bring cell phones, cameras, recording devices, or other electronic devices (such as MP3 players). You will be required to return it to your car. The Court may grant permission to bring cameras in for ceremonial proceedings or court events. Contact the local clerk’s office for more information. Cameras are allowed at naturalization proceedings. The main public entrance is on State Avenue which is the south side of the building. Only employees are allowed to enter the building on the north side. Handicapped parking is available in the gated State Avenue lot on the southwest corner of the building. 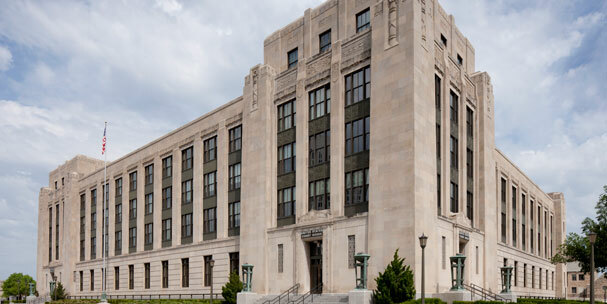 Jury parking and public parking is available on the southeast corner of 5th Avenue and Washington Boulevard (across the street from the First Baptist Church). City parking lots with hourly rates are located on the 500 block of Armstrong Avenue and the 400 block of State Avenue. The strip mall lot on the corner of 5th and State Ave., east of the building, is private parking and you may be towed. MeMa’s Bakery, serving breakfast and lunch, is located on M-level and is open 9:00 a.m. to 2:00 p.m. A variety of vending machines are available on level M. For more local restaurants,click here. 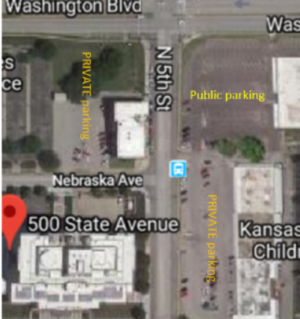 The public and jurors should park at the Townsite Parking Garage, located approximately ½ block east of Kansas Ave on 5th Street (just before the road curves and becomes Quincy). Parking for jurors only will be validated by the Court. At times the garage can fill quickly so please allow enough time to locate a parking space and for the short walk to the building. Do not park in any reserved spaces or in prohibited areas. The Court is not responsible for any parking citations you may receive and will not validate parking for jurors at any other facility, unless the Townsite Parking Garage is full. A cafe is located on the 1st floor and is open 7:00 a.m. to 2:00 p.m. Monday through Friday. A variety of vending machines are also located on the 1st floor. For more local restaurants, click here. 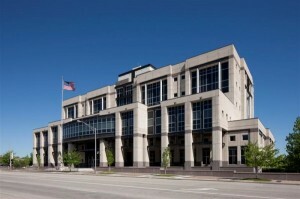 Several parking options are available near the courthouse including the Epic Center garage at the corner of 2nd and Main Street, the City of Wichita parking lot which is one block west of the intersection of 3rd and Main Street and the Sedgwick County Parking Garage located at 603 N. Main Street. Some lots have attendants while others require you to have exact change. Parking fees vary but on average cost $5.00 per day. 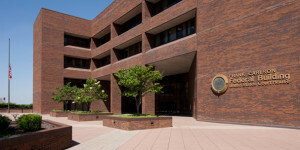 There is also 2 hour metered parking available within walking distance to the courthouse. Jurors should only use this option if the all day parking lots are occupied. Vending machines are available in the break room on level B. There are several restaurants in the downtown Wichita area. For a list of nearby eateries, click here.